Let's not forget those wait times. Seriously, booted into Windows 10, ran an update check. I checked for updates at 8:10 AM. It finished installing two updates about 8:50 AM. I rebooted into Peppermint 9. The update check had already ran and I installed about a dozen or more updates in about two minutes. So, yeah. And, it's not just Windows on computers. The XBOX consoles take forever to update too, usually when you just want to play a game for a little while or watch something. Not sticking up for winders, but I have '10' successfully dual-booted with Peppermint 7&9 on several machines - some with Secure Boot - both stable installs and 'Skip Ahead' - all running Linux 4.8&4.9 kernels. I update everything several times a week, and the winders installs can take 1-4 hours, but I haven't had a failure in months. The trick is to have your hardware, drivers and BIOS updated, and keep them that way. Otherwise, winders will give you the finger without warning. Linux - Even where you have hundreds of updates generally takes minutes. Problem I'm have now with Windows updates is the way they keep overriding settings I've applied, which is damn annoying because it takes you a while to get a handle on what's likely to get reset to defaults, on which computers, and when. Have you noticed that Windows update takes an inordinate amount of time cataloguing your system before it even starts downloading updates ? Why the **** can't it keep a running catalogue (like Linux does), why do you appear to have to go through that half hour cataloguing after each update cycle and reboot ? Reasons to use or not use Windows off the top of my head. 1) When you first boot up Windows 10, Windows 10 has some beautiful Spotlight images which change quite frequently. In other words, Windows 10 has many pretty pictures. 2) You can play with browsers such as Google's Canary Browser, or Opera Neon, in Windows. 3) Skype integrates best with Windows. 4) You have friends or family members who have Windows, and because of this you're able to talk somewhat knowledgeably about the Windows if you're running Windows yourself. 5) Some of its apps, such as its news or weather app, are pretty good. 6) Windows has a digital assistant called Cortana. 7) Photos in an external hard drives look better when plugged into a Windows computer than one running Linux. 1) Windows needs to run an antivirus program, and Windows is frequently subject to attack. 2) Its updating process can take a long time. 3) There is very little support in Windows. 4) You have to buy it -- even though it profits off of your personal data. 5) You have to keep and eye on and update individual programs as well as keep an eye on and update Windows OS separately itself. 6) You have to go online frequently to download programs which may or may not have been vetted for malware or privacy and security issues. 7) Even if you can read code, you won't be able to read the proprietary code of Windows. You have to have blind faith that Windows programs are secure and well intentioned. Heh! 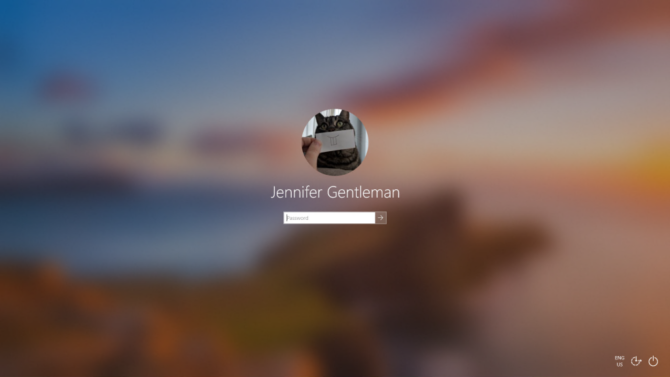 Wait until you see the spotlight login in winders 19H1 ('Redstone 6'). It's frosted/blurred. Soon as one logs in, the 'frosting' disappears and the underlying wall/background is focused. Let's remember what Bill said! With a tweak or two, I see bumper sticker potential here. Good one, scifidude79!